LPG Regulators | Decks Awash! They come in two varieties, single stage, of the like you might see on a small BBQ, and two stage. The two stage ones work by having the first stage drop the pressure from the tank to a “domestically” usable pressure, the second stage compensates for atmospheric pressure variations and stops free flow in case of a line break downstream. The two stage ones are vented to the air, and it’s important that the vent isn’t obstructed… Like by a big wave, or several of them, breaking over the bow. Not designed for submersion, apparently. Our’s started dying on that rough trip from Chinaman’s to Wineglass. Then we were enroute to Georgetown from West Arm when we encountered a down-in-the-bow rig tender doing 12.5kts up the river. It’s wake was monstrous. Up we went over the first wave, then, as she plunged into the trough, the second wave broke over the bow, over the staysail cover, and flooded over the decks. The boys hatch in the forepeak wasn’t quite down, there was some water in there. The mushroom vent in the head was open and that got water in there. The dorade drain boxes kept the water from flooding into the saloon. 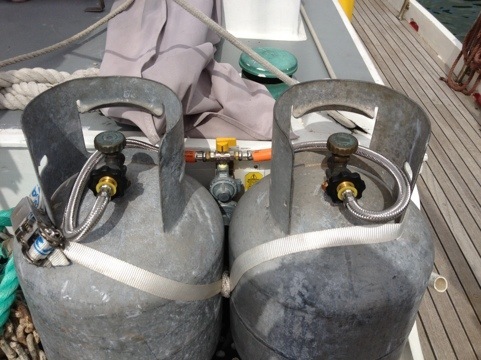 The LPG regulator on the foredeck, however, was inundated. Submerged to a depth of 30cm, I would guess. The poor thing couldn’t cope, and it died. One burner would work okay, two poorly, and with three burners, everything would go out. Then, as gas pressure dropped with the cylinder emptying, the one burner would barely work. Another category #3 problem. Rankin & Bond Pty Ltd are the place to go for LPG gas stuff. They’re located at 20 George St, Launceston, and their phone number is (03) 6331 5088. The guy in there was great. I took the old one off, complete with the changeover valve and pigtails (the hoses that connect the regulator to the cylinders) and he checked them out, after recovering from the horror of we’d put our regulator through. $150.00 later, I walked out with a new manual changeover valve, two new pigtails, and two new regulators (he let me have two for $36 ea). Half an hour of fitting and waiting for goop to dry we fired up and Yay! We can boil water again! Two stage regulators are required equipment. You cannot install a single stage regulator to a boat to supply gas to anything fixed. The regulator should be installed above the tank valves, not below, like ours and many other boat installations are. It’s physically impossible to install ours anywhere else, so we’ll have to live with it. The reason is that sometimes the gas can recondense in the pigtails and run down into the regulator. Then it’s trying to work with a liquid rather than a gas, and it buggers them. Obviously, don’t immerse them, or cover the breather vent on the regulator. Apparently even a decent spider living in there can ruin their day. Check the O rings on the pigtails, they get a bit chewed and leak. Easy to fix with an o-ring kit. When installing, you have to use yellow gas rated PFTE tape, not the usual white stuff. Apparently you use tape whenever you are screwing in a hard metal fitting into a softer one. You also have to use this locktite like sealant gunk. You use that on all flared fittings and flanges, including fittings where there’s a nozzle seating into a socket. Obviously, check your work with some detergent and water to see if there’s any leaks. Carry spares. We now have a spare regulator, plus the dead one. I kept the old pigtails and valve as spares too. I read on the old Internet thingy that you could revive a dead (from clogging or drowning) regulator by boiling it. I haven’t tried it, but mentioned it to the gas guy at Rankin & Pond and he’d never heard of such a thing. Still, it might be worth trying if you are stuck in the middle of nowhere with a dead regulator and some means of boiling water. Ah – another informative blog Mike and Larissa. Another lesson here is that you do need at least two ways to boil water. hence we have a gas BBQ – on deck with a seperate regulator and vented overboard. No need for gas detectors and the like and a useable way to eat warm stuff at sea. I recall going in to Rankin and Bond’s foundry – further along the road to get a pair of bronze rowlocks cast when I built the Nutshell Pram about 20 years ago. I took with me a pair of nylon ones as a pattern with a decent shape and size. The guy there looked at the nylon pattern and took me down the back and uncovered a box of wooden rowlock patterns covered in dust. There were at least a dozen. We selected a decent sized pair and he cast them in bronze for $50. You just don’t see place like that anymore.